Maine Inn Broker of Inns, Bed and Breakfasts, motels, educating inn buyers and sellers: Disclosed Dual Agency? In my experience with lodging sales, it can work beautifully! Disclosed Dual Agency? In my experience with lodging sales, it can work beautifully! A buyer client of mine (Jim) is under contract for a bed and breakfast listing of mine in Maine. I'm the Disclosed Dual Agent. I happened to be having lunch today with the seller just before showing the Inn at Bath today (in Bath) to a really great couple I just started working with. So I texted Jim that I happened to be having lunch with the seller of the inn they're buying. He told me some good news I was looking forward to conveying to the seller in person at lunch. 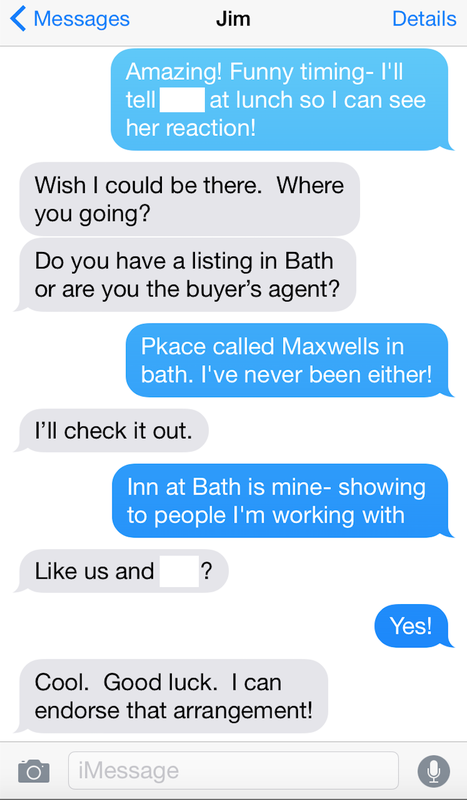 So he asked if I was showing a listing of mine and when I responded with the "Inn at Bath is mine. Showing it to people I'm working with", he responded with "like us and ----?" Meaning the same situation, being a Disclosed Dual Agent representing both sides? Yes, that's me! And the "I can endorse that arrangement" comment at the bottom just made my day! Well, in addition to the good news Jim initially conveyed to me as well as another deal I have going that got beyond a stumbling block! I love what I'm doing and appreciate when clients appreciate what I do!! !